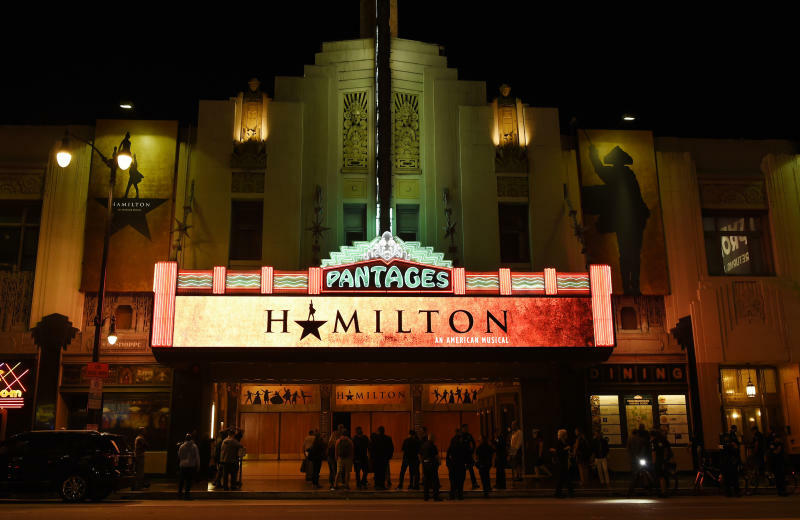 SAN FRANCISCO (AP) — Chaos broke out during a performance of the musical "Hamilton" at San Francisco's Orpheum theater Friday night after audience members mistook a medical emergency for a shooting. A woman had a heart attack and someone broke open an emergency defibrillator, activating an alarm at the same time that gunfire went off on stage as part of the show's duel scene, city fire department spokesman Jonathan Baxter said. The scene depicts the deadly duel between Alexander Hamilton and Aaron Burr. "We all ducked and ran out of the theater, one person was yelling 'gun,'" tweeted Shirin Rajaee, a reporter for CBS Sacramento who was in the audience. Another theater-goer named Marianne Favro tweeted: "Dozens of us hid behind seats til police cleared us. Very scary." Three people were injured as panicked audience members rushed out of the theater. One person broke a leg and two others had moderate injuries, Baxter said. The woman who had a heart attack was revived and remained hospitalized Saturday in critical condition, he said.